Donald Duck is very quickly becoming one of my favourite Disney characters. 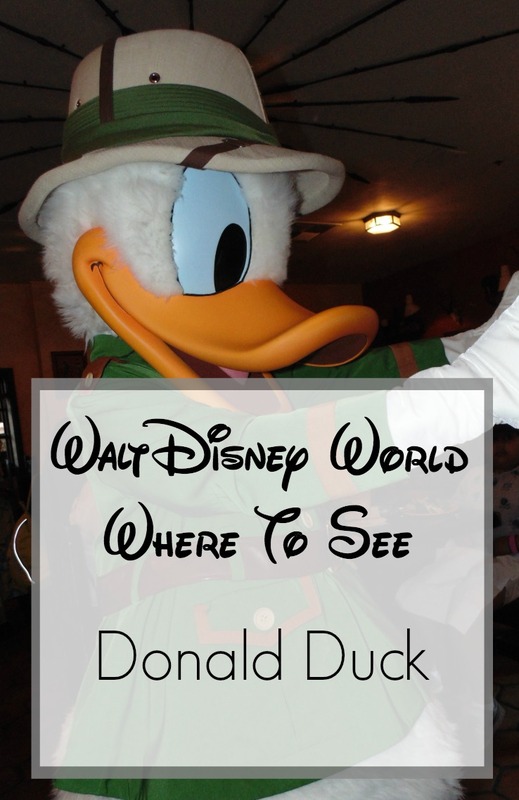 After talking about where to see Mickey Mouse and Minnie Mouse, I am moving onto where to see Donald Duck. I remember our first holiday in 2014, we had to choose between the line for Donald or Daisy on our first day in Hollywood Studios. Miss A chose Daisy so we missed out on seeing Donald at the time because he was gone by the time we made it through the line to see Daisy. We weren’t disappointed for long though as I remember arriving in the midst of a Frozen Summer fun event that happened in 2014 and the character were out dancing in the street. We got to dance with Donald as well as Daisy which was great fun. Donald can be found in Storybook Circus as The Astounding Donaldo. A place we have never managed to make time for in the past, but it’s definitely on the agenda for the next trip. Donald can also be spotted on the Move It Shake It Dance Party floats, dancing along to the tunes. He can also be spotted during the Festival Of Fantasy Parade with Daisy. If you’re visiting Mickey’s Not So Scary Halloween Party then Donald can be spotted in the Boo To You Parade. Over in Animal Kingdom, Donald can be found in his safari gear in Tusker House as he spends time with the diners. If you haven’t got a character meal booked, don’t worry as he can be spotted over in Dino Land in his park ranger outfit for meet and greets. In Epcot Donald can be spotted in the Mexican Pavilion in World Showcase, dressed up in his Mexican gear. When new cast members are training, it’s possible to spot Donald out and about at certain locations through Epcot. These locations could change though, we’ve never been lucky enough to spot him, but who knows you might. With Minnie’s new seasonal dine at Hollywood and Vine restaurant, Donald can be spotted amongst the guests. If you’re dining at The Beach Club at Cape May Cafe for breakfast, you can spot Donald Duck greeting the guests. Likewise you can spot him in his chef’s outfit over at The Contemporary Resort at Chef Mickeys. Have you spotted Donald Duck anywhere else?